Southern Hemisphere August 2014 Background Radiation Report. August’s 2014 monthly average background level was the lowest August monthly average since pre-Fukushima at 4% above the pre-Fukushima month average. August 2014 background levels here have been very stable. This August saw a longer period of Southern Ocean air flows than previous years for August, It is still quite cold here even now considering the time of year. Even thought the local background level for August 2014 is showing a drop, the August rain water test is showing an increases in Lead Pb-210 and Beryllium Be-7. 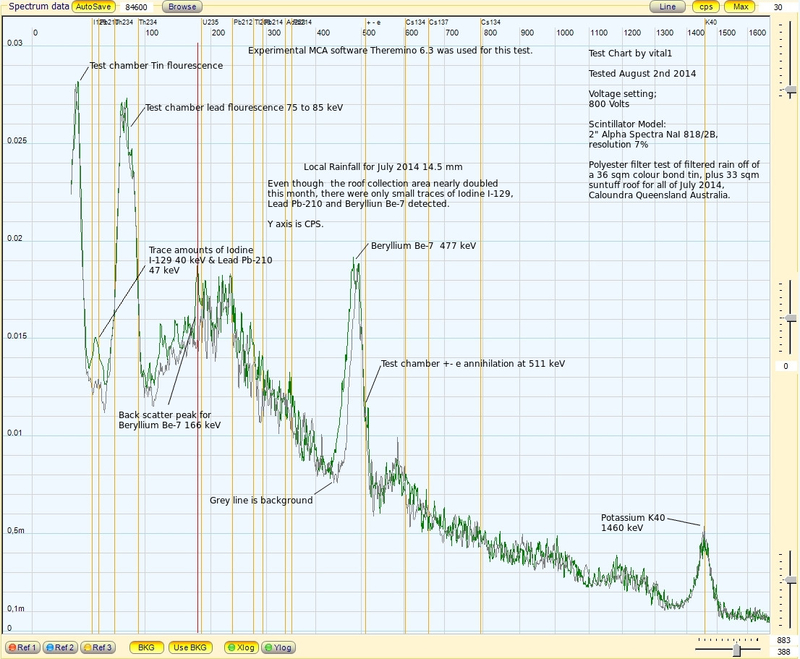 I will post test chart of the August rainwater test, and a report soon. August 2014 was 4% above the 4 year pre-Fukushima average. Even thought the roof rainwater water collection area that passed through the polyester filter has been nearly doubled this month, there were only been very small traces of I-129, Pb-210 and Be-7 detected. July rain fall was also low at 14.5 mm. In this chart I have CPS on the Y axis to show activity, and have turned off Y log to show linear scaling. Southern Hemisphere July 2014 Background Radiation Report. July’s 2014 monthly average background level is the same as July 2013, 5% above the pre-Fukushima average. This is less than the 9% above average for 2012. July 2014 background levels here have been very stable. This generally occurs every winter, as we get increased Southern Ocean air flows. Since May, the room where the monitoring Geiger counter is located, has had the ceiling, roof over the room, and carpet replaced with new materials, plus the walls have been newly painted. The wooden furniture the GammaScout Geiger counter sits on has also been changed. It is still in the same location in the room. Overall as far as I can tell, this has not significantly changed the ambient background. If it has, it is by a very small amount. July 2014 was 5% above the 4 year pre-Fukushima average. At this location, the data suggests airborne radioactive contamination leakage into the Southern Hemisphere has stabilized at present, as increases are not as dramatic as previous years. June 2014, 7% above the 4 year pre-Fukushima average. I have a large 30 square meter concrete slab that flows into one drain. It is an uncovered area at the time of sample collection. It had become full of runoff. This runoff had formed a fine soil with fine plant roots throughout it. When I cleaned the drain out, I collected a 526 grams sample, and placed it into a marinelli beaker for testing. This is mainly the soil, minus the fine plant roots. I did not dry it out, so there would be some water content. Lead Pb-210 is the end product of atmospheric Radon Ra-222 decay daughter isotope washout, and has a half life of 22 years. Radon itself is a decay daughter of Uranium U-238 decay. Are more Radon decay daughters being created in the atmosphere by the huge amount of nano sized Uranium particles released from the Fukushima Nuclear Disaster, and the use of Depleted Uranium (DU) ammunition? When I do a scintillator test I usually have two free MCA software programs running at the same time, Theremino and Becqmoni. This allows me to cross reference chart test results. Also, each software package has different advantages over the other. I used Becqmoni to work out the Pb-210 activity, in Becquerels per kilogram, for this soil sample. 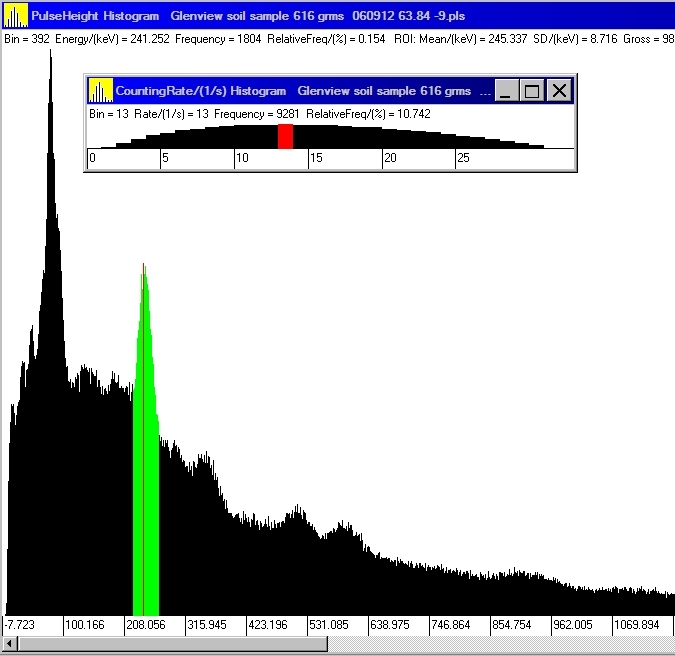 The rest of the spectrum is a mixture of Uranium and Thorium decay daughters, plus some Be-7. 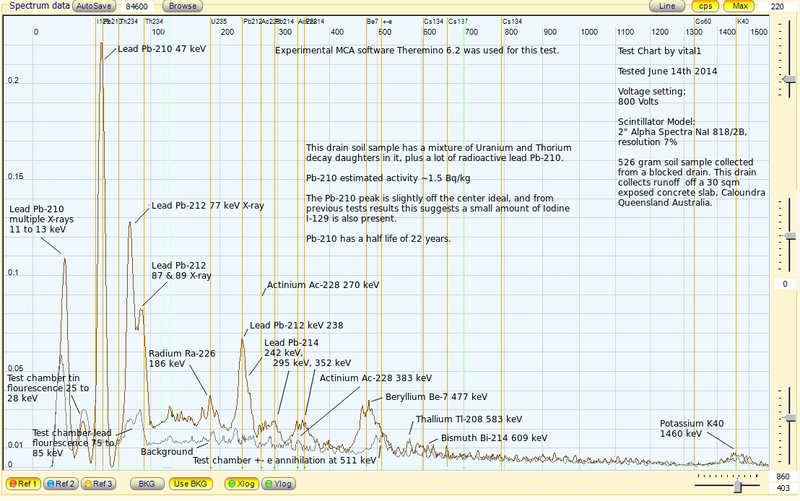 The peak around 186 keV is most likely Radium. Maybe just a concentrating effect of the of Pb-210 from the large concrete surface area into this drain. Here are some previous local soil tests. The detected amounts of Pb-210 present in these tests is a lot smaller. This one was a soil area, where a tin roof drained onto it. I was sent twin bananas to test, from Northern New South Wales. Around the same time, we also found a mutated strawberry in a strawberry punnet, purchased from the local supermarket. The strawberries came from Victoria. Both the banana and the strawberry samples were long count tested, with a very sensitive Geiger counter. These tests showed no elevation above background. The samples were then tested with a Scintillator, in a lead and copper lined test chamber. Each sample was tested twice, and each test was run for 24 hours.